The project aims to familiarise the successful candidate to use efficiently the High Performance Computing system ARIS in GRNET and optimize his/her application in the field of regional climate modelling. 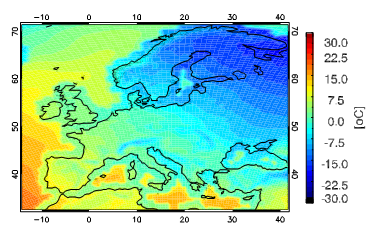 A hindcast regional climate simulations will be performed over the European domain in coarse resolution (0.44 degrees) with the use of the regional climate model WRF (Weather Research and Forecasting model). Mean winter (DJF) temperature for the time period from 1990 to 2008 as simulated by the regional climate model WRF. The successful candidate will have the opportunity to learn how to use the GRNET HPC system ARIS. The awarded computational time for the project will be used for the performance of regional climate model simulations. Good experience in the use of WRF software. The final product will be a dataset of regional climate simulations (netcdf format) and some associated graphical representation of it that will be created in collaboration with the student undertaking the second proposed project. A set of benchmarking simulations will be performed to investigate the potential of the model to optimize in ARIS HPC. The required software is the numerical model (WRF) which is already installed in HPC.ARIS. Post processing tools and libraries are as well available (cdo, netcdfetc). 1 Pings/Trackbacks for "European climate model simulations"